The shape of the cabinets show off its quirkiness and originality. SKU: oc1083. Holds up to 95 CDs over 5 fixed shelves. Fixed shelves: 14h x 19w x 17d cm. COLOUR: Natural. CAPACITY: CAPACITY: cd = 95. Iron welding, mountain moon shape, beautiful shape. Material:Wood Iron. 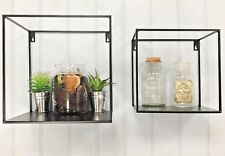 Can be used as a storage rack or as a decoration. Suitable for any wall, bedroom, kitchen, office, dormitory, kitchen, living room, etc. SKU: ZAS034153039. COLOUR/FINISH: Beech. MADE IN THE UK.